Heem-La is an Argonian mage and a Conjurer of the Guild of Mages. 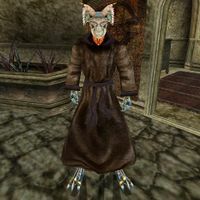 He sells some unique spells in his private room in the Ald'ruhn Mages Guild, behind a closed door immediately to the left of the entrance. He is only wearing a common robe. He is carrying a steel flameblade and three random scrolls. Like all Argonians, he is immune to poison, has a resistance to disease, and can breathe underwater. Aside from that, he knows the following spells: Bound Dagger, Bound Gauntlets, Bound Spear, Bound Boots, Summon Ancestral Ghost, Summon Least Bonewalker, Summon Skeletal Minion, Hide, Sleep, Greater Fireball, Greater Frostball, Third Barrier, Second Barrier, Greater Shockball, Armor Eater, Weapon Eater, Weary, Wild Flay Spirit, Wild Levitate, Distraction, Enervate, and Spite.